There has been a lot of talk about turning Lake Worth’s liabilities back into assets, and the Golf Course is an example of doing just that. However when it comes to the City Swimming Pool at the beach the Commissioners need to take a hard look at the economic realities of our pool and the national trend towards municipal aquatic parks. Stand alone “rectangular pools” are a thing of the past and even our pool’s location by the beach is not enough of an attraction to draw people on a regular basis or attract swim meets. Across the nation older municipal pools are being shut down, often replaced by aquatic parks that cater to whole families. No amount of “out of the box marketing” can succeed in bringing people to a facility that is no longer viable in today’s recreation market. Swimming lessons and water aerobics can still be held in a smaller pool, and the other features will be attractive to summer camps, handicapped organizations and others to rent. A quick internet search reveals that even public facilities that retain olympic sized pools are installing more family friendly features to cater to a larger customer base and increase revenue. With the Casino redesign at hand, now is the time to cast aside the sentimental clamor to patch up our city’s biggest white elephant and plan for a water park that will provide families with what they want and attract enough users to make it self-sustaining. Click here for the professional view on making a public pool profitable. In the current era of public pools, size, design, and management need to be planned even in the infancy of the project. What kind of features does the public want and what should a pool have to offer? These are 2 main question when proposing pool projects. Understanding consumer behavior is also important when designing proposals. There are 2 main consumer behavior facts that pool developers and the city government need to take into account when building a new pool facility or adding on to an existing pool. The first fact is that people spend more time on the deck than in the water and they want to come to a pleasant environment (Turner, 47). Therefore, the whole atmosphere is just as important as the pool and its features. Greenspace, lounge furniture, shaded chairs/tables, along with quality concessions adds to the ambience and experience of patrons (Turner, 47). In fact these items are not only add to the pool experience but are often expected by customers in order to assure future attendance. The second fact is that the overwhelming majority enjoys participatory aquatic entertainment for the entire family (Turner, 48). To accommodate the whole family and provide entertainment, many new popular pool features have been added. 0 depth children’s pools are extremely popular as are jungle gyms, mini-waterslides, and fountains (Turner, 48). Two public pools in the Upper-Midwest, Eau Claire, WI and Apple Valley, MN, have 0 depth children’s pools. These shallow areas are in fact the most crowded sections in each respective facility. Apple Valley also had fountains and a mini-waterslide, 2 special attractions for kids. Attractions for older kids and adults include special waterslides (speed, intertube), log walks, and diving boards (Turner, 48). Families want these extra features and do not just want a common pool with lap swim. The young and old want entertainment equipment at the pool and this is what draws people on a weekly or daily basis. “Competitive swimming will always be a priority. Swim teams consistently draw kids and teens. Swimming competitively keeps them occupied in a healthy way and often teaches them their first lessons about sportsmanship. Especially now that there’s so much concern about childhood obesity, no one is going to take swim teams away. The Cleveland Municipal Pool will not open this year. This entry was posted on March 24, 2010 at 1:17 pm and is filed under Uncategorized. You can subscribe via RSS 2.0 feed to this post's comments. Jo-Ann sure is looking buff! I, too, am sentimentally attached to the pool. But I think that an aquatic park will help pay for the casino upgrades. And the casino upgrades MUST happen this time around. So let’s all cry a tear and move on. 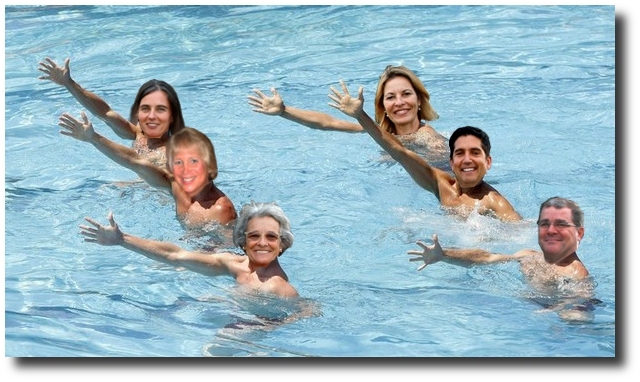 There’s always the pool at LWHS. And thanks for the internet research. I’m going to read it all. Are you working for the City yet? You were at the same meeting, the city seems intent on fixing the pool and I am pointing out why it is not a good idea. Please show me the research that shows that supports your opinion. I need research to support an OPINION? Still waiting for that research, huh Tom? Please post it when ms. congeniality sends it over. The problem here is the hardened opinions people have adopted from the git go. That is a problem with the discussion, not the pool. And it may prevent agreeable folk from being able to agree. In the abstract, this flaw of process is obvious; and may be informed by considering the distinction between the exercise of reason and the exercise of reasoning. One operative assumption may be that the former is an objective value and the latter an argumentative display of confirmation bias. Back to the pool. There are many questions that need to be asked, answered, and contextualized. Let’s start with the historic -instead of the histrionic- for a change, and then move forward. A short list: How did we get here. Where are we. Where do we want to go. I’ll suggest that we are haggling over the third question without good answers to the first two, but so be it. What man-made aquatic feature[s] should be maintained, abandoned, or newly considered for our municipal beach? What are the feasible means of capitalizing the various options, in addition to other pros and cons? What opportunities/circumstances either present or prohibit concurrence with other beach projects? What are the broad, and specific, expectations of the community regarding the outcomes from any decisions taken? I am throwing in these last two because it seems to me we need to start looking at a larger picture, through cogent interaction, in order to execute a coherent plan for our community’s development. And if anyone thinks any of this -re: the pool, the beach, or the meta- is going to be accomplished soon, I’ll respectively submit that you’re wrong. At the end of the day the talk is what is cheap. Especially compared to repeating the expense of poor decisions, urgently taken, and improperly executed before the conflicted interest in arguments made can be ferreted out. That may sound complex to some. I believe it is the epitome of simplicity to build clarity, transparency, and empathy into all of our communications. Thank you for doing some research and for posting your perspective. While I agree that a multi-faceted aquatic park would be (in a perfect world) a terrific addition to our city, I don’t believe we have the resources to pay for these kinds of upgrades. Your research is from locations where pools are only open during certain times of the year of if indoor – are minimally utilized when the temperature drops below freezing. Having spent some time in Madison WI during the winter – I can’t imagine anyone thinking about taking a dip. Consequently, I think that this data comes from a perspective where the facility has to earn dollars in a very limited time period each year and probably is very under utilized at all other times – begging the question among tax payers as to why are we paying for this white elephant? LW has the luxury of being able to use our pool year round. We offer one of the very few venues in the Country and probably world-wide where competitive swim teams can come to train and compete. This is why the Italien Team was slated to come this year before the closure. These teams generate public interest, and tends to spread tourist dollars around our town. If we can’t afford an aquatic theme park, and we have to upgrade our pump and motor facilities anyway – why not explore the interim measure of getting our existing facility back up and running so that we can take advantage of the demand for the existing facility. These teams pay top dollar to the city to rent our facility. Some income is better than no income and once the facility has not been used for a period of time, it becomes more and more expensive to get it back up and running at a later date. Lake Worth seems to have a habit of throwing up hands when it is seems difficult to make a decision and we always end up paying more for it in the end. I appreciate your providing a place to discuss this Tom and I hope we can continue to gather perspectives on this important topic.